If only saving the world cost as little as $450.3 million. But to pay that much for a painting? 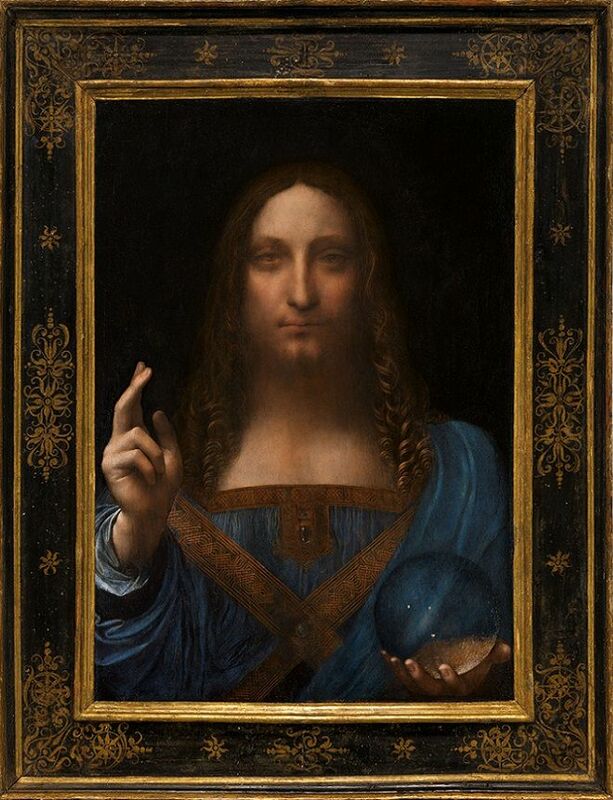 That figure made even billionaires gasp, and it’s part of the sit-up-and-take-notice story behind Leonardo da Vinci’s “Salvator Mundi,” which shattered auction highs when it sold at Christie’s in New York shortly before Thanksgiving. Who would pay such a princely sum for a painting? A prince, as it turns out. Not just any prince, and not the Saudi prince who first claimed to have purchased it, but the endgame is that “Salvator Mundi” is headed to a new museum in Abu Dhabi, the capital city of the United Arab Emirates. As rich as that story is, it’s fair to say that da Vinci’s life story can match it and raise it fifty grand. Leonardo died five hundred years ago, in 1519, and yet even way back then, he imagined man soaring through the air in flying machines. And traversing the high seas in submarines. During his sixty-seven years on the planet Earth, he pursued so many interests–architecture, anatomy, mathematics, astronomy, military engineering, sculpture, botany, music, etc.–that for him, painting was almost a sideline. But oh, such paintings. “Mona Lisa,” it’s believed, is a portrait of a wife commissioned by a wealthy Italian merchant, but da Vinci never gave it up, continuing to perfect the painting until his death. Today the Mona Lisa is a French national treasure housed in her own special room at the Louvre in Paris. A glass ceiling helps show her in her best light, and she’s displayed behind a shatter-proof case lest thieves try to run off with her again or disgruntled suitors try once more to attack her. Da Vinci painted “The Last Supper” on the wall of a Milan monastery in the 1490s; almost immediately the paint began to flake. A few centuries later Napoleon and his troops used the building as a stable, followed by another century in which the Nazis bombed the monastery. Even many restorations later, the painting is not in the greatest shape, but every year visitors purchase tickets months in advance to see da Vinci’s depiction of the twelve disciples–their facial expressions and body language–just after Jesus tells them one of them will betray him. Milan, like all of Italy, is mostly Catholic–or Christian. How intriguing, then, that a painting of Jesus Christ bestowing a blessing on the world will be displayed in a Muslim country’s new museum. As I began to follow the threads of this story, “intriguing” was trumped by HOPEFUL. Here’s why. The Louvre Abu Dhabi opened its doors in November, around the time the winning bid for “Salvator Mundi” was accepted by Christie’s. A Louvre in Abu Dhabi? That was my first reaction on seeing a December 6 tweet from the museum that they would be displaying the da Vinci. It turns out that about ten years ago, the United Arab Emirates (UAE) signed an agreement with the French government: the French would help the UAE establish the first universal museum in the Arab world. Can belief in any one religion save the world? Christianity has the largest number of followers, followed by Islam, which is the fastest growing religion in the world. The other three most influential religions are Buddhism, Hinduism and Judaism. However, if all non-believers formed a single religion, it would be the world’s third largest. That’s a whole lot of people with different beliefs. I like the idea of this museum, a grand stage that says it will display “both ancient and contemporary works of historic, cultural and sociological interest from around the world,” that says it will “explore connections between civilizations and cultures, even though they’re geographically and time-wise far apart,” that has the courage and moral authority to display a portrait of Jesus as the Savior of the World, within the borders of its Muslim country. The UAE, an oil-rich country, says that part of the thinking behind this museum is looking and planning ahead for the post-oil age. Ah, they must be men and women of science. Climate change, new energy sources, dropping oil prices. Leonardo da Vinci, a man of science, would approve. Thanks, Patty. It brightened my day just to write about it, whereas so much about what’s going on in the world pummels the spirit. In praise of art!